Here are some creative uses for plastic or wooden clothes pins from our ThriftyFun community. Post your own ideas here. Clothes pins close the many open packages of food in our kitchen. From potato chips to pasta to chocolate chips to frozen peas, we use springclothes pins. We keep a bunch of them in our utensil drawer in the kitchen. Glue a small magnet to a clothespin and hang it on the fridge door. As you create your grocery list and collect coupons for this week's list, put them in the clip to keep them handy. Clothespins can also be used to clip notes to yourself, directions, etc to the visor of your car, to remind you. I decorated a clothespin to look like a lady bug by painting it red and black. I put a magnet on the back and I use it as a fridge magnet to hold notes or recipes. I also use them for closing cereal bags. Use it as the mouth when making a wood duck or other wooden animal crafts. Makes a nice decoration for your desk that can be used to hold out going mail or phone messages. They are good to keep in the closet to put on the shoulders of dresses that keep slipping, pants that fall off the pants hangers, or matching skirt outfits. Cheaper than getting the specialized hangers. And in the closet they hold my sweaters on the hangars. Lets not forget to save energy and use them for what they were intended to hang wash outside. Great invention thats for sure! Sorting and keeping together similar paperwork in preparation for filing. The clothespin at one edge makes it easy to locate the clipped papers. Keeping my bank deposit card and deposit envelope together in the car on the way to the bank. Keeps them visible so I don't forget to make that stop! Clipping outgoing mail on the outer rim of the totebag I carry to work so I can remember to put the envelopes in the mailbox. Keeping articles to be mailed to friends separate -- I write their names on individual clothespins -- they stick up from my desktop file so I can find them easily when I want to make an addition to the collection or mail them all off. Reminders: I write the task on a bright piece of paper and clip it and the clothespin in a conspicuous place. This can avoid the mess of cellophane tape in a hot car or a thumbtack that can fall to the floor under bare feet. I put a wooden clothes pin on my softener sheet before throwing it into the dryer - that way when I remove the clothes from the dryer, I can easily locate the dryer sheet and toss it back into the next load. Good way to use those sheets until completely devoid of fragrance and static guard. Go to your lumber store and purchase dowel rods. Using a glue gun, glue clothes pins on the dowel rods as far apart to hold these hats that men collect and have all over the place. I can get 8 hats on a dowel rod. Then I drill a hole it the top in order to nail to a wall in our bedroom. My husband has 1 whole wall with nothing but hats. To keep hats from getting dusty, I put the hats he doesn't use in plastic zip lock and clip to the back of the hat or the brim whichever way you want to hang them. You can paint them to make them attractive or make them to give as gifts to men who have lots of hats. Lets see, my husband has approx. 250 hats on his wall. During the winter months, I tie clothes pins to jute rope and hang them from a hook near the coat rack. I dry little kids mitts this way. I hang them on nails (through the round opening in the spring) and clip large spools of ribbon to my studio shelves. I have a clothes pin on my car headlight switch. If I turn my lights on in the daytime, I put the clothes pin on my shirt to remind me to turn lights off when I get out of the car. It has been known here in Trinidad to use wooden clothes pins to make rocking chairs and water wells. 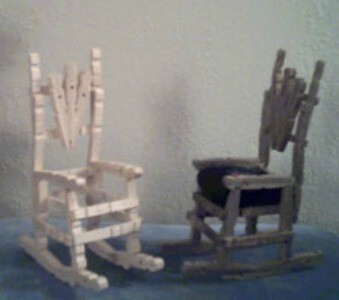 To make the rocking chair, all you need is the clothes pins and glue. For the well: wooden clothes pins, glue and an empty sausage tin. I am a high school student and I clip different colour clothes pins on my books, binders, reports, etc., in my locker as a reminder of which ones go to certain classes. For example: French class is a blue clothes pin, math is green, career choices is yellow, etc. I use the clip-type clothespins to keep tarps on things outdoors. I use the pins to secure the plastic garbage bag in my trash can. I hate it when the bag falls into the trash can and I have to pull it up over and over again (I don't like to keep a lid on the can because I think lids are a nuisance). The clothes pins do a great job of securing the trash bag so when your teenagers throw something heavy into the can, the bag will stay secure to the edges of the trash can. We have a cocker spaniel with long ears. When I am feeding her leftovers that are messy and that her ears would get into, I grab a clothes pin and pin her ears over her head. She patiently waits for me to clip her ears because she knows she will get something good. My parents always used clothes pins to secure a paper napkin around our necks during messy meals like spaghetti, ribs, etc. or whenever I had nice clothes on such as dining before or after church. The paper bibs protected our clothes and saved money on dry-cleaning and laundry. Use them on a wire hanger to keep ties or scarves in place. Drape up to 4 ties across the bottom of a wire hangar and clip each tie in place with a clothes pin. Nail the back of a wooden clothespin to the wall, and use it to clip coats, keys, or any similar item (reminders to take something to work). Or nail them up near your dressing area to hang clothing you wish to air out. Pins can be decorated for a fancier look. Paint two wooden clothes pins in a color that coordinates with your curtains, and then nail them (one on each side of the curtains) in to the wall. Use them as curtain tie backs. Use as plant markers. Clip to small, round dowel and poke dowel into dirt. Then clip the empty seed package on the clothespin. Used on a wire clothes hanger, they serve to hang skirts. Anchor a hanger to a cup hook outside to dry an item without the wind blowing the hanger to the ground. Morning reminder for kids off to school: Plastic butterfly clips usually have a hole in the grasping pieces. Tie a small piece of heavy cardboard to the clip by running a piece of yarn through that hole and a hole in the cardboard piece. Using a marker, write on the new tag what the child needs to take to school such as "PE Clothes". Clip onto the child's lunch tote to be seen as a quick reminder for those recurring but not daily tasks. Clip outgoing mail or reminder note to purse strap sure to be seen when leaving for an errand. Clip key ring to a bag as reminder to take it for delivery when running errands. Clip reminder note onto placemat to remind family member of a task or just to deliver a message without it being whisked off the table by a quick breeze. Use as a giant paperclip. Use to hold songbook open on the keyboard book rack. When no barrette is handy, use clip to pin hair back out of the face momentarily while doing a task where flowing hair is a nuisance. Clip a kitchen towel to your skirt waistband as a quick apron. Use as small clamps when doing craft projects or repairs. Use to clip a napkin to a child's shirt for a quick bib. Wrap wet bristles of a small paintbrush in plastic when taking a break. Clip plastic to the handle with a clip to seal.